Electro specialists Hot Chip have formally announced their return with the almost-eight-minutes-long 'Flutes'. Brave move. But one that looks set to pay off, considering the track's hypnotic vibe. It's the first glimpse of the forthcoming new record, 'In Our Heads' which follows up 2010's 'One Life Stand'. Listen to the track below and watch its head-spinning video. Many of the band members have been doing their own thing - side projects like New Build and the lawsuit-inducing Bang & Olufsen as well as producing, as Joe Goddard has done with DELS. 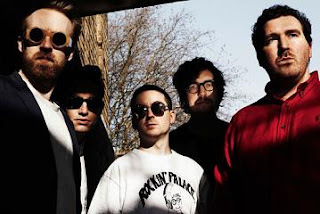 But in and around those other projects, they've all found the time to get back into the Hot Chip groove. 'Flutes' kicks off with an intro reminiscent of M.I.A before travelling into a territory occasionally occupied by dance legends Underworld. It's characteristic Hot Chip but done in slow-burn style. It'll be out on limited 12" vinyl at some point but if you pre-order the new album through their new label Domino then you can pick up a free download immediately. 'In Our Heads' is released on June 11th in the UK. More details at hotchip.co.uk.